No matter where you live, no matter how big or how small, the kitchen is the heart of every home. I have seen very cramped and cluttered ones as well as the large and lavish. The common factor in them all is that food, life, and love happen in your kitchen. And since the journey is mine, I think we should begin where life happens in my home...my kitchen. I live atop a hill, in a moderately sized town, in the northern valley of West Virginia. 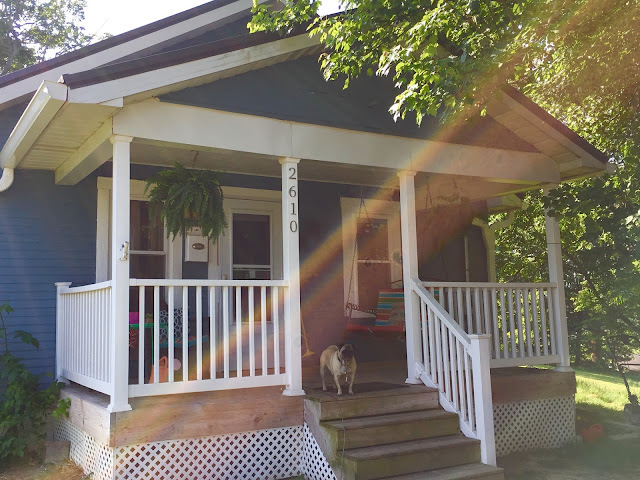 My home is a small 1,100 square foot a-frame, white, three bedroom, one bath, nothing special house. I reside there with my husband of nearly 14 years, my 89 year old mother-in-love, two dogs, and two cats. Yes, my little 1,100 sq. ft. cottage is bursting at the seams, but at the center of my humble abode is something unique. Something special. It is our little heart, our little 10x12 galley kitchen. Even though it is too narrow to have a dishwasher, and I can literally get to any point with two steps and a reach, I assure you there is more life happening there than in most kitchens 10 times its size! Yes, this is the entire kitchen! I am standing on the back wall. I wish that I had photos to share of the kitchen when we originally moved into this house 12 years ago. All of the cabinets and counter space were located on one side and were severely out numbered by all of the decorative shelving. They were one solid unit, and a bear to remove, but my wonderful husband persevered and now I have the most beautiful kitchen a creative cook could want! This wall looked nothing like this when we began. The open pass-through was not there, neither were the cabinets or countertop. I love to cook so I designed the kitchen to have PLENTY of workspace and the ability to talk to my family at the same time. :) I found these great pictures out of magazines and on Pinterest to decorate. The sign above the opening reads "I love you more..." which is what my husband and I always say to one another. In small kitchens you must utilize any and all space for storage so I keep my onions, garlic, bread, and potatoes in these inexpensive baskets on top of my fridge. I am the type of person who is inspired by everything around her. Therefore, I have all sorts of little jewels throughout my kitchen that warm my heart. As I pointed out earlier, I love to have signs all over, tiny morsels of positivity speaking into my life. There is one here that hangs above the sink that simply states "LOVE". It speaks to me because without love we have nothing. Love should be at the very center of who we are and should drive us in everything we do! There are many stories to be told of my kitchen treasures. Here are a few of my favorites. First thing's first...The coffee machine! *lol* I seriously enjoy coffee! Anyone who knows me will testify to that. This is where every day begins and ends in our home. It starts at 6:30 am with the initial gurgle of percolation and ends around 10:00 pm as it is being prepped for the next day. Oh how we love our coffee! Let me count the ways...There is caramel mocha, caramel macchiato, peppermint mocha, Heath, pumpkin spice, oh, and let us not forget the glory of good ol' black! My heart is singing just thinking about it! In case you haven't noticed, I have a thing for owls. I guess it comes from them being a symbol of wisdom and the Bible saying we should diligently seek it, but this little guy is my favorite. At first glance you would say "Oh what a cute little cookie jar, but he is so much more! What you are looking at is my memory jar! It was put together by my family to honor my husband and I as being a wonderful aunt and uncle. Inside are little pieces of paper full of precious memories from me, my husband, my siblings, my parents and my oldest and dearest friends. Whenever I need a pick me up I head over to it and pull one out. I have yet to walk away without a smile. What sits on top of my cabinets is priceless to me. There lies several items from my mother's, mother-in-love's, grandmother's, grandfather's, great-grandmother's, and great, great, great, great-grandmother's kitchens! Pictured here is a rolling pin from the Civil War era. It is carved of one single piece of wood. The rolling is all done by your hand and though it is warped and unusable, every dent I look at is a meal made with love from my great, great, great, great-grandmother's family. I hope one day to be able to pass something as symbolically precious down from my kitchen. I have so many of these tidbits that I could prattle on all afternoon about, but I will save some of those for another day. I would love to see and hear about any of your kitchen treasures as well! So I know after reading all of this you may be thinking "What was the point in all of that?" Well, the answer is simple. In order for me to share my kitchen life with you, you had to be introduced to the place where it all goes down. The heart of my home, which is actually a reflection of my heart, that in turn is what this blog is all about. Me sharing pieces of who I am with you and your family. There will be food yes, but there will also be stories and advice. There will be laughter, there will be tears, but kitchen life is all about the journey and I am so excited to be going on this journey with you. Looks Good Like all the pictures and descriptions Cute!! Have you read my blog? It doesn't have cute pictures LOL it is Chronicling my recovery and on going Issues? Thank you! No, I haven't Joy. I wasn't aware you had one, but I will check it out. Awesome! I'm looking forward to following your blog :) I love the memory jar idea! Thanks Tammy! Isn't that a cute idea! We do those in our family for gifts quite often and you can continue to add and add to them! Looking forward to your yummy recipes! Awww, thak you Kelly and thank you for checking out my blog! Living Well and Spending Less has really inspired this whole thing. 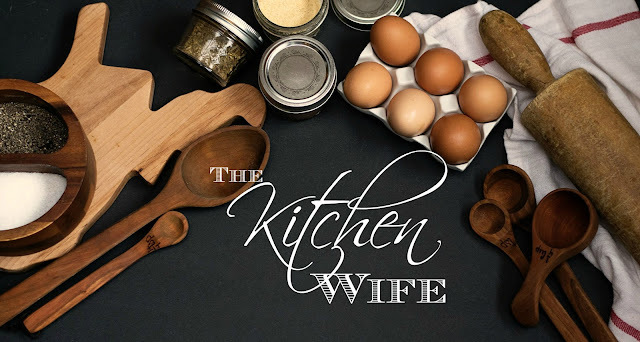 I am so glad you are following me and please feel free to share your own photos and recipes on my Facebook page The Kitchen Wife.